Not many from the Indian under-19 team which returned home with the World Cup from New Zealand after an imperious display of cricketing skills may make it to the senior team—only seven out of 75 youngsters who have played in the under-19 World Cup in the past ten years have gone on to play Test cricket. But a new cricketing brigade is being readied, a crack unit with famous surnames like Tendulkar, Dravid, Sehwag, Mongia and Hirwani. We are not contemplating an all-star Indian veterans’ team. These surnames could well furnish Indian scorecards once again, say in about five to seven years from now, though with different first names like Arjun, Samit and Vedant. They are the sons of former India players like Sachin Tendulkar, Rahul Dravid, Virender Sehwag, Nayan Mongia and Narendra Hirwani, who are currently wielding the willow and tweaking the ball mightily well, thus raising the ultimate expectation. If they continue to perform in the nat­ional domestic tournaments like they have been and make steady progress, they could well emulate their fathers. Apart from the stalwarts named above, the sons and daughters of Mohammed Azharuddin, Sunil Joshi, Ajay Sharma, Rudra Pratap Singh (senior), and ex-women cricketers Rajini Venugopal, Roma Singh and Koka Suneetha are also dreaming big in cricket. 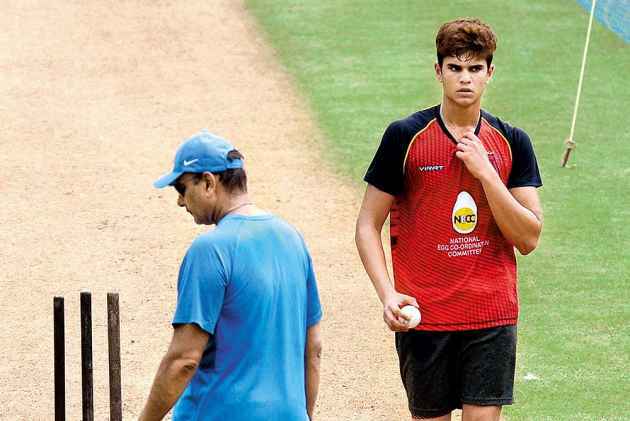 The new generation youngsters include Arjun Tendulkar, Samit Dravid, Mihir Hirwani, Mohit Mongia, brothers Aaryavir and Vedant Sehwag, Sunil Joshi’s son Aryan Joshi, England-based Rudra Pratap Singh’s son Harry and daughter Anjalie, Roma Vanka’s daughter Pooja, and Koka Suneetha’s daughter P. Charishma. They all are aged between 11 and 23. Among all current ‘star kids’, the spotlight has been on 18-year-old Arjun Tendulkar. Primarily a left-arm pacer who can also bat well, he represented several junior teams in India and England—he has also bowled to the England team batsmen at the nets at Lord’s—before breaking into the Mumbai under-19 team for this season’s Cooch Behar Trophy. He captured 18 wickets in five matches. Apart from the close watch by his dad, Arjun, a Class IX student at Mumbai’s Dhirubhai Ambani International Sch­ool, has had a few coaches, including Wasim Akram, former India speedster Subroto Banerjee (2014 to 2016) and Atul Gaikwad, a double Level-III coaching certificate holder from India and Australia, since late 2015. “A pacer should have the intent to bowl fast and he has that intent 200 per cent. He wants to be the No.1 fast bowler in the world. The biggest positive about Arjun is that, like his father, he is very passionate about cricket and very hard-working. He is always hungry to learn; he’s never satisfied,” says Gaikwad. “Arjun swings the ball both sides, in and out. He is a natural player, and I tried to keep him as natural as possible. I did only a little bit of fine tuning,” former Bihar pacer Subroto Banerjee, who guided Vidarbha to the Ranji Trophy title as a bowling coach this season, tells Outlook. The young sons of Dravid and Virender Sehwag are keenly pursuing cricket at the school level. Both have two sons each and are backing them to the hilt. Samit, 11, and Anvay, 9, are batsmen and studying in Standard VI and III, respectively, at Mallya Aditi International School in Bangalore. School coach Lakshmi V. Kumar, a BCCI Level-I certificate holder who represented Karnataka in 100-plus matches, says both are talen­ted. “Samit doesn’t have an attitude...that he’s a celebrity son. If we say something he’s ready to accept it,” she says. Incidentally, former India left-arm spinner Sunil Joshi’s son Aryan is also a student at Mallya Aditi and is making rapid strides as a batsman. Aryan and Samit are in the same age-group school team. Of the youngsters, 23-year-old Mihir, the son of Narendra Hirwani, is the only one who has made his first-class debut, in 2014-15 for Madhya Pradesh. 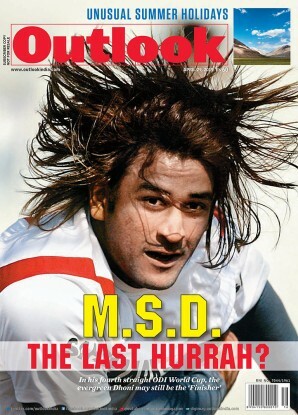 On comparisons with his fat­her—both are leg-spinners—Mihir tells Outlook: “Dad told me pressure is there, so silence critics with performance. I want to represent India and stay there for long on the basis of my performance.” This season he bagged 31 wickets, including four five-wicket innings-hauls, in seven Ranji Trophy matches. Former India wicket-keeper Nayan Mongia, whose son Mohit is a contender, feels their wards will be part of all major domestic tournaments soon. “If they continue to perform well, in five-to-seven years all these surnames—Tendulkar, Dravid, Mongia, Hirwani, Joshi etc—could be seen again in India, playing cricket. It will be great fun to watch these boys play,” he tells Outlook. And does Mongia, who played 44 Tests and 140 ODIs in the ‘90s, foresee all these youngsters possibly being part of Team India? “Yeah, it will be a big achievement if that happens,” he says with palpable excitement. Incidentally, only a handful of sons of former India captains have gone on to represent India. The exceptions being Iftikhar Ali Khan Pataudi (son Mansur Ali Khan, who even captained India), Lala Amarnath (sons Surinder and Mohinder), Vinoo Mankad (Ashok), Dattajirao Krishnarao Gaekwad (Anshuman), and Pankaj Roy (Pranab). Naturally, too, most cricketers don’t beget cricketers. M.A.K. Pataudi’s son Saif is, of course, an actor. Former captain Bishan Singh Bedi wanted his son, Angad, who also bowled left-arm spin like his father, to make a career in cricket and had set a time-frame to judge his progress. “I was simply observing his intensity. He wanted to play cricket as a ‘pastime’, which never works in the process of excellence. And his heart was in the celluloid world, so that’s where he has landed. Good luck to him. I was never going to interfere in his life’s choices,” Bedi tells Outlook. Bedi didn’t force his daughter to play cricket or any other sport either. “I don’t remember if Neha was keen on sports, though she loved swimming.... But nothing to do with cricket, which was just as well. I don’t think I’d have coped with politics in women’s cricket,” he says in a lighter vein. Former India skipper Dilip Vengsarkar has a son and a daughter, but they too chose a different field to excel. While son Nakul is an interior designer and architect, daughter Pallavi designs premium luggage and accessories. “They never played the game,” says Vengsarkar. However, all three sons of former captain Vinoo Mankad played first-class cricket, and one of them, Ashok, Test matches. The others, Atul and Rahul, represented Saurashtra and Mumbai, respectively. Interestingly, both Ashok’s sons Mihir and Harsh—he represented India in Davis Cup—played tennis, like their Asian and natio­nal singles champion mother, Nirupama. For long, former cricketers’ daughters had chosen fields other than cricket. But more girls than ever are picking up the kitbag. Like the daughters of former India ODI player Rudra Pratap Singh (senior), who played league cricket in England in the ’90s and settled down there. He is encouraging his daughter Anjalie, 15, along with son Harry, 13, into cricket. Both are regulars in age-group teams of Lancashire. Anjalie has even played for Lancashire County Women’s 2nd XI and was recently selected for ECB North Region Emerging Players Programme. “If they are able to play for India it would be fantastic,” says Singh, who worked as Lancashire’s Cricket Development Manager & county coach. Earlier, most cricketers’ daughters chose other fields. But now, Anjalie Singh, P. Charishma and Pooja Pratap are bucking that trend. A few daughters of former players, both men and women, are showing ample promise too. Pooja, 14, daughter of ex-Hyderabad cricketers Roma and Vanka Pratap, who also represented India A in 1990s, made headlines last August when she hammered 174 not out in an inter-school match in Hyderabad. Another talented girl is P. Charishma, 15, daughter of ex-India A player Koka Suneetha. She has been picked among the Hyderabad under-23 probables, having done well for the city’s under-16 and under-19 teams. In an interesting trivia, the daughter of Susan Itticheria, a former India woman cricketer who appeared in seven Tests and two ODIs between 1976 and 1978, national squash champion Dipika Pallikal, is married to India wicket-keeper Dinesh Karthik. Former India batswomen Rajani Venugopal’s son Aksh­ath Kumar, now 25, represented Hyderabad in age-group cricket, before switching to medical science in 2015. “I got a 600-yard ground on lease outside my house in Hyderabad. I would make Akshant practise for two hours, and I also bought a bowling machine for him. I worked hard for him. But he didn’t get the right opportunities at the right time,” rues Rajani. Like Akshath, many others will not be able to emulate their parents for various reasons. Breaking through to the top level needs that extra will-power, true grit, the ability to capitalise opportunities and lots of luck. India colours are won through hard labour.